The United Nations’ interventions in the Sierra Leone Ebola outbreak led to a dramatic drop in the transmission of the disease, according to a study led by a University of Florida Health researcher. The study, published today (Monday, March 28) in the Proceedings of the National Academy of Sciences, marked the first time transmission dynamics of Ebola in Sierra Leone were evaluated at a fine scale, according to the researchers. They examined two categories of transmission: transmission within a household and transmission at a population level within a chiefdom, an administrative unit akin to a county in the United States. When the United Nations intervened in Sierra Leone to slow the Ebola outbreak in October 2014, the country saw a 43 percent reduction in the transmission at the population level. When the intervention was completely in place by the end of December 2014, the rate dropped by 65 percent at the population level and 82 percent within households, according to one of the study’s first authors, Yang Yang, Ph.D., an assistant professor in the department of biostatistics in the UF College of Public Health and Health Professions and the UF College of Medicine, part of UF Health. Yang said the paper’s findings underscore the need for early intervention in disease outbreaks. In ring vaccination, responders vaccinate everyone who comes in contact with a person who contracts Ebola. Ebola hemorrhagic fever, a virus that causes severe bleeding and organ failure by reducing blood flow to organs, spreads among humans through contact with bodily fluids. The U.N.’s plan, called the United Nations Mission for Emergency Ebola Response, called for a spectrum of interventions, including identifying and isolating cases of Ebola, conducting safe burial practices and establishing Ebola treatment centers and mobile laboratories. 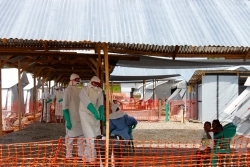 The researchers gathered records of people diagnosed with Ebola as reported to the Sierra Leone Ministry of Health and Sanitation from May 2014 to September 2015. Of the 95,089 records of Ebola virus tests — one patient may have multiple records of tests — submitted to that agency, the researchers identified 8,358 confirmed cases and 3,545 suspected cases. The proportion of health care workers among Ebola cases was quite high in the early phase of the outbreak, highlighting the importance of employing personal protective equipment and timely training of medical staff from the beginning. Yang said their evaluation of household transmission was based on matching cases using self-reported information about the heads of their households and residential locations. Then, the researchers used census-based demographic information such as the distribution of size of the households to complete their data analysis. The research team found women were at a slightly higher risk of being infected with the disease — possibly because of their role as caretakers, the researchers surmise. This was consistent with previous research done by other scientists, Yang said. The study was done in collaboration with researchers from the State Key Laboratory of Pathogen and Biosecurity in China’s Beijing Institute of Microbiology and Epidemiology; the Sierra Leone Ministry of Health and Sanitation; the Sierra Leone-China Friendship Hospital; the Anhui Medical University in Hefei, China; and the Vaccine and Infectious Disease Division of the Fred Hutchinson Cancer Research Center in Seattle. Funding for the study was supplied by several organizations, including the Special Program for Prevention and Control of Infectious Diseases in China, the Basic Work on Special Programs for Science and Technology Research, the Natural Science Foundation of China and grants from the National Institutes of Health’s National Institute of General Medical Sciences and the National Institute of Allergy and Infectious Diseases.